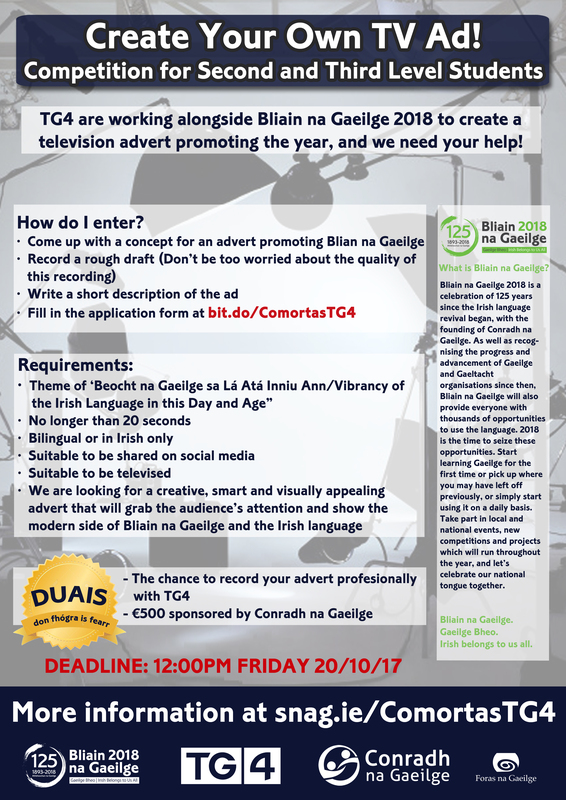 TG4 are working alongside Bliain na Gaeilge 2018 to create a television advert promoting the year, and we need your help! This is a great opportunity for students in secondary schools and third level institutions alike to participate in a national competition, improve their communicative skills and win brilliant prizes, sponsored by Conradh na Gaeilge. Come up with a concept for an advert promoting Blian na Gaeilge. Write a short description of the ad (100 – 200 words). Fill in the application form at bit.do/ComortasTG4. Bliain na Gaeilge 2018 is a celebration of 125 years since the beginning of the revival of the Irish language with the founding of Conradh na Gaeilge. As well as recognising the progress and advancement of Gaeilge and Gaeltacht organisations since then, Bliain na Gaeilge will also provide thousands of opportunities to use the language. 2018 is the time to seize these opportunities and to use Gaeilge where you can. Take part in local and national events, new competitions and projects which will run throughout the year, and let’s celebrate our national tongue together.